May 10, 1974. The segment from 0.8 miles below Cashiers Lake in North Carolina to the Tugaloo Reservoir. The West Fork from its confluence with the main stem upstream 7.3 miles. Wild — 41.6 miles; Scenic — 2.5 miles; Recreational — 14.6 miles; Total — 58.7 miles. Flowing through three states and the Ellicott Rock Wilderness, the Chattooga is recognized as one of the Southeast's premier whitewater rivers. It begins in mountainous North Carolina as small rivulets, nourished by springs and abundant rainfall. High on the slopes of the Appalachian Mountains is the start of a 50-mile journey that ends at Lake Tugaloo between South Carolina and Georgia, dropping almost 1/2-mile in elevation. The river is one of the few remaining free-flowing streams in the Southeast. 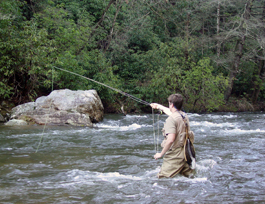 The Chattooga offers outstanding scenery, ranging from thundering falls and twisting rock-choked channels to narrow, cliff-enclosed deep pools. The setting is primitive; dense forests and undeveloped shorelines characterize the primitive nature of the area. No motorized vehicles are permitted within a corridor about 1/4-mile wide on either side of the river. Visitors must rely on their own skills and strength rather than on motorized equipment. Man-made facilities are minimal, consisting primarily of hiking trails. The river's outstandingly remarkable values include recreation, biology, scenery, geology and history.